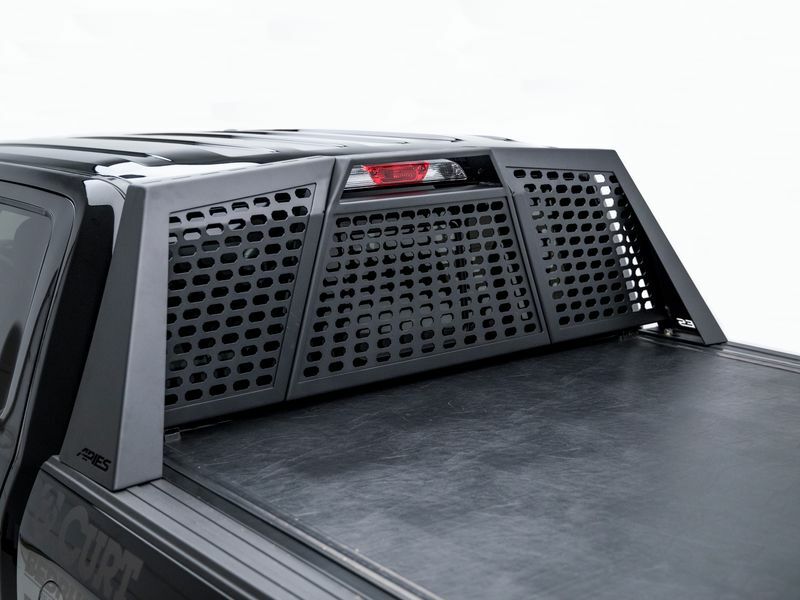 An Aries Switchback headache rack offers a beefed up, unique look along with excellent protection for your truck's cab. The octagonal grid sections also help set your truck. Total aluminum construction keeps the headache rack lightweight and able to withstand the elements. The rugged octagonal design of the mesh adds strength and the carbide black powder coat finish ensures you get maximum corrosion protection. A track system along the top provides a flexible mounting solution for adding LED light bars, tie-downs, or other accessories. Aries Switchback headache racks use a patent-pending stake pocket mounting system that uses the strength of your truck bed to hold it in place. Aries designed this mounting system so that the rack wouldn't interfere with other common truck bed accessories like fuel tanks or tonneau covers. Get a new look with the American made Switchback headache rack, it even comes with a five year warranty! Adding your new headache rack to your truck bed will not be complicated. Installation won't require any special tools and should only take about a hour or so out of your weekend. If you want more information or have a question you would like answered, please give us a call and we'll be happy to help you out!